Victoria, Mahe (Seychelles) – October 1, 2018 (travelindex.com) – Seychelles will see its 2019 Budget presented to the National Assembly for discussions, debates and for approval. The island’s Council of Ministers are probably already discussing the fine print of this document that will impact, in one way or another, on the lives of each and every Seychellois. On the tourism front, Tourism Operators working with Seychelles from right around the world are saying that the writing is on the wall if the Government refuses to hear their plea of the island’s private sector trade, for a budget that is deemed appropriate for the industry that remains the pillar of the Seychelles economy. Discussions today are centered around the need to increase the Seychelles Tourism Marketing Budget. Too many Seychellois are dependent on this industry and so many local investments depend entirely on a buoyant tourism industry. New airlines have launched their services to Seychelles, and today we are connected with a range of direct non-stop flights to Europe. Europe remains the main tourism source market for the islands, and it will need to be continuously nurtured. It is the budget of 2019 that will consolidate the good news brought by the arrival of adequate air connectivity that we are now enjoying, but that has taken years to materialise. The appeal on behalf of Seychelles is to ensure the ability of the Tourism Board to be supported enough, so that they can work with their airline and tour operator partners, and to be free of bureaucratic cobwebs so that they can respond fast when working on marketing partnership proposals they received. Failure to show care and understanding of the tourism industry may be costly and could well result in the discontinuation of one or more of the air services in place today. We should never take what we have today for granted. Seychelles needs its airline partners because the island’s tourism industry remains dependent on them, and the island’s economy on its turn is dependent on tourism, the industry that is the main pillar of the Seychelles economy. The islands must appreciate the seriousness of the situation and the importance of pushing for a budget that shows we want tourism to work, because that is the only way to strengthen the “We Are Tourism” call being spearheaded by the private sector. Rene Michel passed away at his residence at Les Mamelles in the early hours of the morning of Saturday the 29th September, aged 65, with his family by his side. Rene Michel, brother of my wife Ginette, is the man behind the Michel Holiday Apartments and the Michel Villas. He was also the partner of Philip Esparon in Mahe Cars (Car Hire company) and his Aqua Glass Company in partnership with Charles Pool was a supplier of locally made to measure fiberglass swimming pools and moulded plastic water tanks, primarily for the tourism industry. He leaves behind his wife Heather, daughter Amy and son Ben. To mark Tourism Day 2018 it was the “Happy World Tourism Day” message that echoed in Seychelles and in each of the other islands making up the Indian Ocean Vanilla Islands group (Seychelles, Mauritius, Reunion, Madagascar, Comoros and Mayotte). A special welcome on Tourism Day was organised for all disembarking passengers in Seychelles. Tourism Officials were at the airport promoting the Pristine Seychelles campaign among arriving tourists together with their working partners – the Seychelles Civil Aviation Authority (SCAA) and the Seychelles Hospitality & Tourism Association (SHTA). Pascal Viroleau, the CEO of the Vanilla Islands also issued a statement to mark this year’s Tourism Day. Ambassador Ronny Jumeau received this year’s Excellence in Leadership Award from SIDS DOCK and they referred to him as the “Ocean Whisperer from the Seychelles”. Messages of Congratulations on Social Media applauded Ambassador Jumeau for receiving this well deserved award. His tireless work in championing SIDS makes Seychelles and the Indian Ocean Vanilla islands proud. Receiving the Excellence in Leadership Award from SIDSDOCK at the UN Headquarters in New York says it all. “A very emotional moment, speechless, had no idea what SIDSDOCK has reserved for him this year. I was proud to be there to witness that moment” said Ambassador Jumeau after receiving the Award. Ronny Jumeau was the Seychelles Minister responsible for the Environment prior to his posting in New York. Proud of you Ronny! 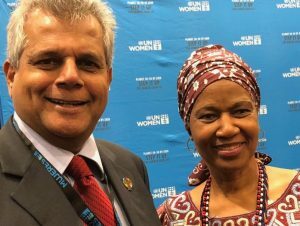 Vijay Poonoosamy met with Dr Mlambo-Ngcuka, UN Under Secretary General and Executive Director of UN Women, at a UN Women UNGA VIP lunch. Vijay Poonoosamy is from Mauritius Island and is today making the Vanilla Islands of the Indian Ocean proud. Vijay Poonoosamy has also been appointed on the Board of Saudi Arabia’s Red Sea Development Company where he sits proudly alongside Sir Richard Branson, Steve Case, Philippe Cousteau Jr, Carlos Duarte, J. Carl Ganter, Paul Holthus, Aradhana Khowala, Sven-Olof Lindblad, William McDonough, Frits Dirk van Paasschen & Sonu Shivdasani. Congratulations to Vijay Poonoosamy. We are all proud of you. The Red Sea Development Company, owned by Saudi Arabia’s Public Investment Fund, has announced the formation of its “global advisory board” made of 12 international experts in business, tourism, sustainability and environment. The advisory board will help set the agenda and plan for Saudi Arabia’s Red Sea Project, a vast tourist development aimed at opening the economy, off the kingdom’s western coast. The Red Sea Project is part of an ambitious plan to create an ultra-luxury tourism destination for nature, adventure, wellness, and culture, as part of Saudi Arabia’s Vision 2030. John Pagano, CEO of the Red Sea Development Co, said in a statement obtained by Al Arabiya English that seeking the assistance of the top consultants to guide the company is an important factor to execute this project on global standards. “TRSDC’s Advisory Board is playing a fundamental role in the development of the project,” Pagano said. “The insights and advice that we gather from the Board are extremely valuable in assessing and tailoring the effectiveness of our current plan. This will enable us create something truly unique for our guests and for the people of Saudi Arabia, as we set new international standards for protecting, preserving, restoring and providing access to a unique experience at this site for generations to come,” he said. The advisory board members will carry out multifunctional roles when working with the company’s Board of Directors and its executive team, and will advise the company’s Board of Directors, which is led by Saudi Crown Prince Mohammed bin Salman. The board members have initially met in New York earlier in March to express their initial visions on the project. Their second meeting was in Saudi Arabia in July during which the team visited the project, its unique land and marine ecosystems, and presented their views on the development and sustainability strategies of the project.